The priceless structures of the 6th century's Byzantine Tower of Pagliazza and the 12th century's Medieval Church of S. Michele in Palchetto have been restored and transformed into this splendid luxury hotel. Today's visitor will find a perfect marriage of ancient beauty and modern comfort situated in a tiny, quiet square in the heart of Renaissance Florence. Florence offers a wealth of attractions within walking distance, such as the Duomo and the Ponte Vecchio. 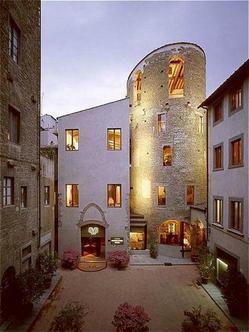 Excursions to enchanting Tuscan hill towns and the rustic Chianti countryside can be arranged. Pisa, Lucca and even Venice and Rome are close enough to visit in a day.